In the eighteenth and nineteenth centuries a wide range of legal issues were decided, not by professional judges, but by panels of laypersons. This book considers various categories of jury, including the trial jury, the coroner’s jury, the grand jury, the special jury and the manor court jury. It also examines some lesser-known types of jury such as the market jury, the wide-streets jury, the lunacy jury, the jury of matrons and the valuation jury. Who were the men (or women) qualified to serve on these juries, and how could they be compelled to act? What were their experiences of the justice system, and how did they reach their decisions? The book also analyses some of the controversies associated with the Irish jury system during the period, and examines problems facing the jury system, including the intimidation of jurors; bribery and corruption; jurors delivering verdicts against the weight of evidence and jurors refusing to carry out their duties. 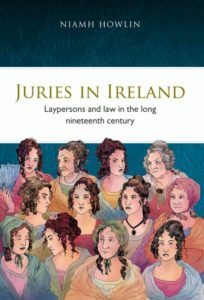 It evaluates public and legal perceptions of juries and contrasts the role of the nineteenth-century jury with that of the twenty-first-century. Niamh Howlin is a lecturer in the Sutherland School of Law at University College Dublin. She has published extensively on the nineteenth-century Irish jury system, as well as on other aspects of criminal justice history and contemporary issues surrounding jury trial. Copyright © 2015 Irish Legal History Society.